Or The Emperor's New Clothes? Dressage is particularly prone to the syndrome of 'The Emperor's New Clothes' i.e. the idolatry of certain figures, whose methods are revered to the point where no one dare say that there could be another way - another definition of dressage that has the same principles, the same goals at its root, but a very different way of realising them. Perhaps if we allow ourselves to see the 'emperor's clothes' for what they really are, then we will open the door to a true evolution and demystification of dressage - one that is not just confined to a few isolated individuals, but that is available to every rider and every horse, for the good of a better partnership in riding. The above drawings have been taken from photo's - on the left an 'old master', and on the right, one of our horses working in postural engagement. It is clear to see that the horse on the left is hoisted up in front by the use of the double bridle, with the rider's hands coming back towards the seat. This gives the horse a superficial appearance of being 'off the forehand', but biomechanically it means that the whole top-line (spinal column) of the horse is contracted, and the hindlegs are not carrying under enough to support the lifting of the spine under the rider. Note that the diagonals are not parallel (see: What does 'on the bit' really mean? for an explanation of parallel diagonals). 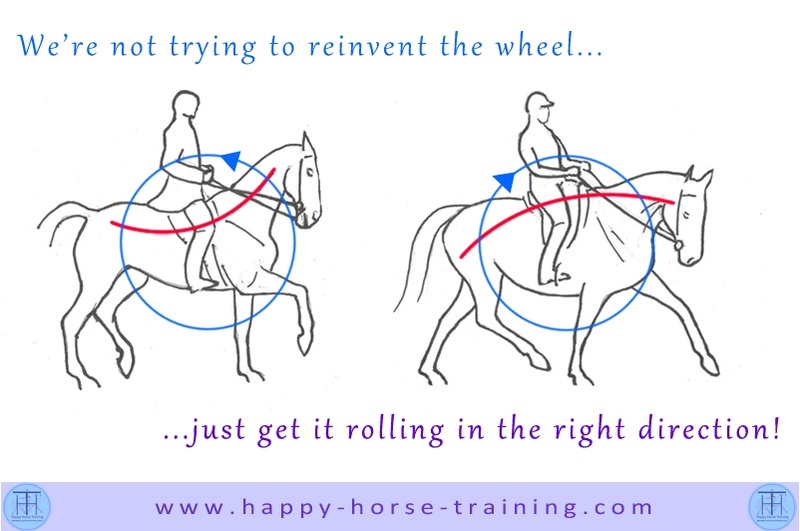 If the horse's energy in movement is considered as a circular flow, this 'wheel' is moving in a backwards direction, against the direction of motion, because the flow is blocked by the bit and the spine is inverted. The horse on the right has a much lower 'outline', but this is absolutely correct for her conformation and true degree of postural engagement. The head carriage has been allowed to be a pure function of the engagement of the haunches and stretching of the spine, instead of being determined by the rider. 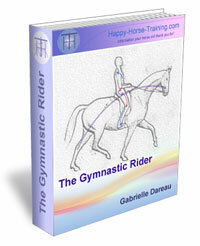 The hindlegs are reaching well underneath to support the lifting of the spine under the rider, and this lifting of the spine allows the energy to flow through to the unrestricted front-end. This transmission of energy from back to front makes the wheel turn in the right direction energetically - forwards. Note that the diagonals are absolutely parallel. This is only possible because the rider has developed a series of gymnastic qualities in her body, which allow her to engage with the horse in such a way as to promote balance and encourage transmission from the haunches. The seat is tucked, so as to be able to follow the propulsion of energy forwards each stride, and the leg is stretched back in order to balance and support the position, and also channel the horse's ribcage. How to Ride Dressage... Real Dressage!